This Short-Row Hat has been giving me fits. At first it was a lot of fun. All those little short-row sections coming together like a puzzle. But it's a real line by line kind of pattern. There are no zoning out spaces. It's nose to pattern and lots of instructions like, "yo, p10, ssp." I completed the first 6 sections and started to feel comfortable. So I tried to knit it in front of the tv. For two nights. 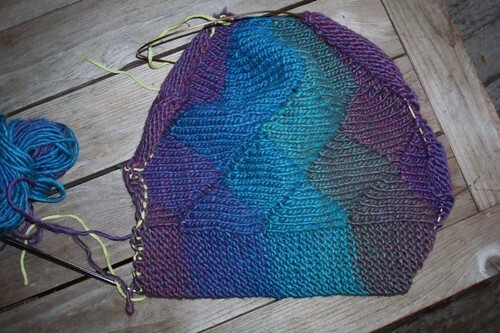 The trouble is if you make a mistake you might not discover it until you've knit several more sections. Then you have to rip and figure out where you are. And there was that time I missed one line of the instructions and was attempting to knit the wrong row over and over and over. That didn't work out so well. But last night I got back into the groove of it and made some progress though I'm still only about half done. 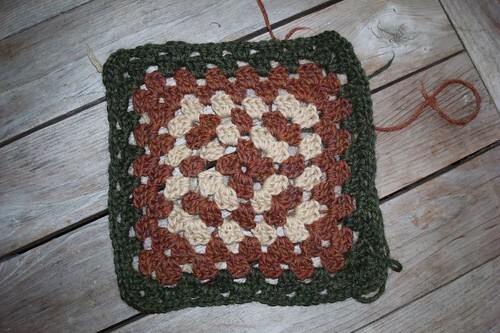 I finished my granny square too. And it's a square also! I know you're thinking, "Yeah, I made stuff like that when I was 8." Well for me this is a big deal.